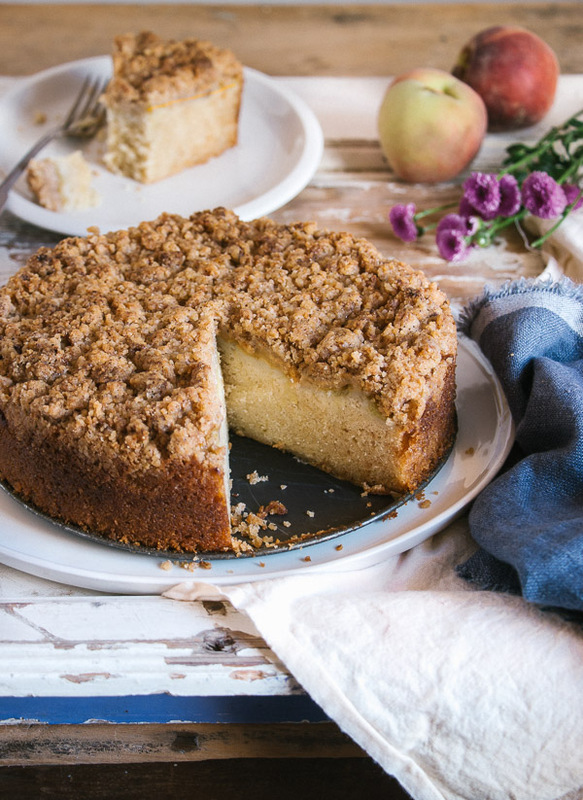 Peach Crumb Cake - Pretty. Simple. Sweet. 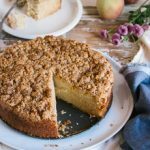 Just when I thought that my favorite coffee cake couldn’t possibly get any better, I decided to add peaches! That’s because there’s a bag full of them laying in my kitchen that my mom gave me last weekend, which isn’t really unusual since she seems to give Erez and me some kind of food every week. I’ve told her that she really doesn’t need to, and that she should realize we’re already in our thirties. “But it’s healthy for you!” she says. Well, at least something good— and I mean really good—came out of it. This is the perfect cake to bring to family gatherings or brunches, or to serve with tea or coffee. 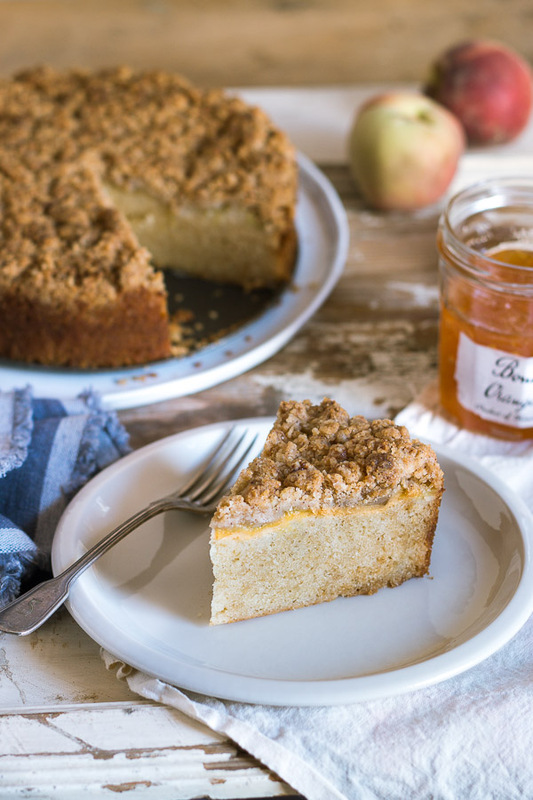 It has a tender crumb, and the juice from the peaches makes it amazingly moist and refreshing. And those thick, big chunks of crumbs on top? Let’s not even go there. That is my weakest spot. If your peaches are ripe and tender, they probably won’t be easy to peel. If that’s the case, you can place them in a pot of hot water for 15 minutes, then transfer to a bowl of ice cold water for a few seconds. Peel them immediately after, using either your fingers or a knife. If you don’t have fresh peaches available, you can use frozen ones. If so, it will be better to cut them into slices while they are slightly thawed. I like that beautiful single layer of peach slices on top of the cake, but instead of arranging them that way, you can cut the peaches into cubes and simply fold them into the cake batter. 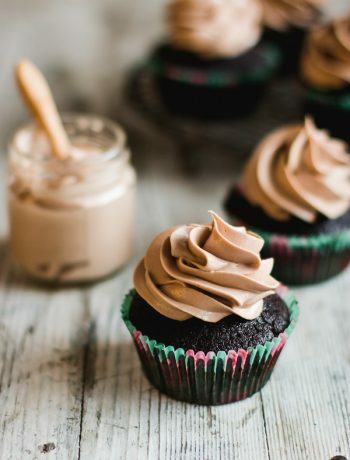 If you happen to have almond extract, add ¼ teaspoon of it to the batter (reducing the vanilla extract to 1 teaspoon) as it adds a wonderful flavor. Preheat oven to 350F/175C degrees. Grease a 9-inch round or square pan. Set aside. To make the crumbs: In a medium bowl, mix together flour, brown sugar, and cinnamon. Add the melted butter and mix with a fork until the mixture is uniformly moistened and thick crumbs form. Crumble it with your hands to make some big chunks. To make the cake: In a medium bowl sift together flour, baking powder, baking soda and salt. Set aside. In a medium bowl using a mixer fitted with a paddle attachment, beat the butter and sugar on medium speed for about 3 minutes, until light and fluffy. Scrape down the sides and bottom of the bowl as necessary. Beat in the eggs, one at a time until combined. Beat in vanilla extract. On low speed, beat in the flour mixture in 3 additions, alternating it with the sour cream in 2 additions, starting and ending with the flour. Do not overmix. Scrape the batter into the prepared pan and smooth the top. Arrange the peach slices over the top of the batter in an even layer. Sprinkle the crumb mixture evenly on top of the peaches, pressing it down gently. 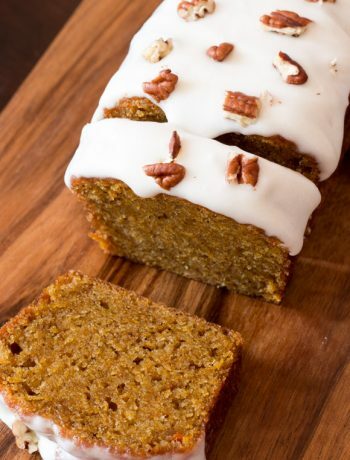 Bake for 50-60 minutes, until a toothpick inserted into the center of the cake comes out clean. The cake will be moist because of the peaches, but make sure it's not raw. If the crumbs layer is getting too brown while baking, cover pan loosely with aluminum foil. Let cake cool completely on a wire rack. This looks so gorgeous, Shiran! 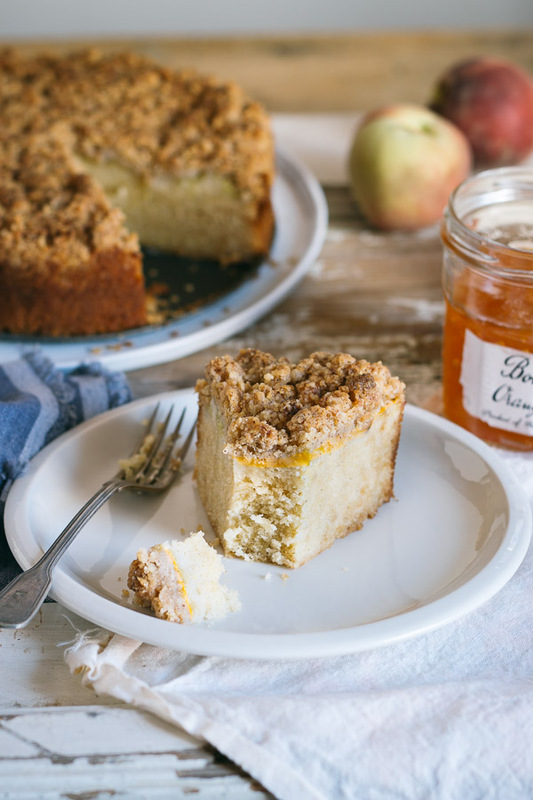 I love the idea of incorporating peaches into a coffee cake. It’s so seasonal and such a lovely combination. Your cake looks so perfect and moist, and I love that you did a clean, neat layer of peaches right on the top like that. Positively gorgeous! Thank you so much for the sweet words, Beeta! 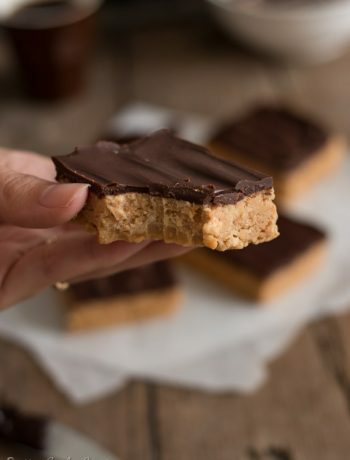 This was a wonderful recipe! I didn’t have sour cream so I substituted with Greek yogurt (healthy bonus!) and it was amazing. My co-workers loved it. Thanks!